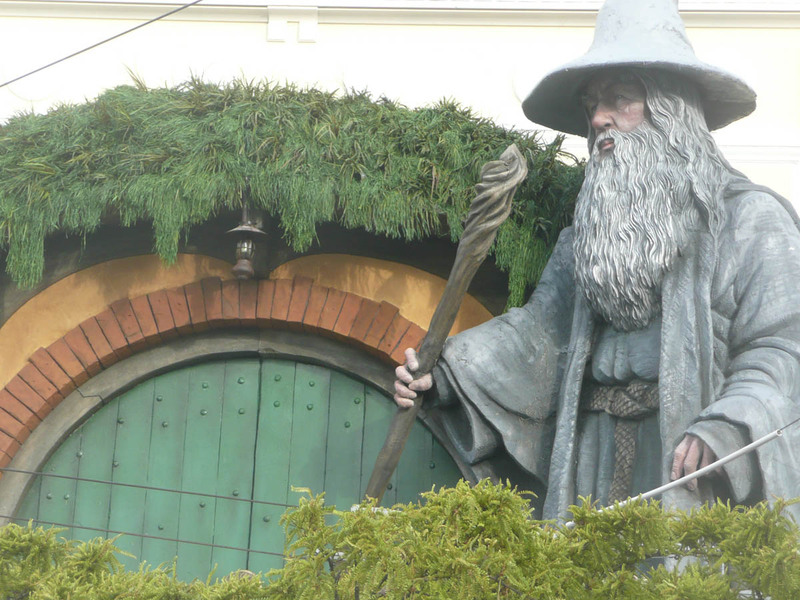 With just over a week to go, and a giant Gandalf up on the front ledge at the Embassy, it seems like that it might just be time for another wee adventure into the architecture of the Hobbit. Last time we had an explore of what it feels like inside a nice, dry, warm Hobbit cave, namely Bag End, the home of Mr ‘Underhill’. This time, we’re off on a visit to see the home of the Elves. Well, at least I think it is Rivendell. I’m getting a little rusty on the story, and shall have to go and re-read it again to myself, but I think that the story is that the merry band of Dwarves plus The Burglar set out to get their gold back from the mines of Moria, where Smaug the dragon awaits. Seeing as there is three films on this project now, we’re not going to see much of anything of Smaug in this first episode, except, I’m betting, a vast golden eye winking open right at the very end, and the sulky, slinky tones of Benedict Cumberpatch saying in his ultra-camp manner “Why hello…. do come in… where I can see you…” (Remember – you heard it here first). 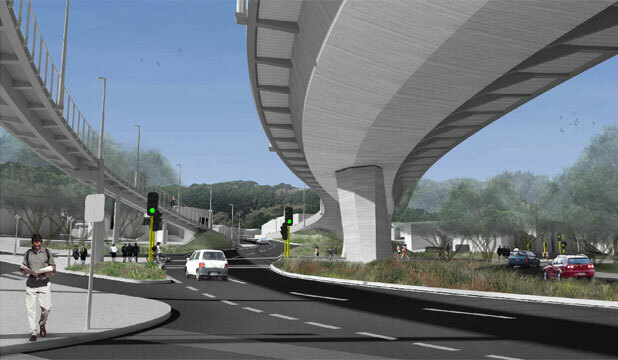 Of course, someone that could also be learning from Hobbiton on how to design a graceful bridge might also be the NZTA, who dropped this clanger today – oh my goodness, what a heifer! Remember: Don’t be an Orc-lander! Small is Beautiful! No flyover! There’s no doubt though that Weta have worked their own brand of Elvish magic on this Taylor-made beauty. It’s a nice line in vaguely Art-Nouveau / Greene and Greene brothers kind of mid-century Medieval mashup, with (of course) pointy roofs (to match those Elvish pointy ears), naturally large eaves and overhangs in which to avoid those damp waterfall conditions, and most of all, a nice line in covered colonnades. I love colonnades. There’s something about the mesmeric repetition of the line of columns, and as long as you’re not as blind as a bat, then colonnades are just the bees knees. Luckily, Bilbo thinks so too. Attention to detail is, as ever with the crew at Weta, pretty damn hot. Here’s our intrepid Hobbit scaling the stairs – not an easy thing to do, I’d imagine, with those large hairy feet tripping on the risers, but at least the handrails seem to be of a suitable height for both man and halfling. Nice, wiggly, twig-inspired balusters too by the way. He’s off to check out the in-house entertainment, namely the rooftop jousting exercise. I’m SURE that no horses were hurt during the making of this film. Traumatised, perhaps, by having 100 kilos of fat sweaty dwarf sat on his buttocks (that’s enough to traumatise anyone, by the way), but certainly not falling to death into the beautiful CGI sunset mountainside. Short of PETA amusing us all by getting naked, their planned protest sounds the most pointless thing of all. Saint Peter hurt an animal? No, can’t believe that. A latex headed dummy? Sure thing – but not real animal. It’s evidently always twilight in Rivendell, as the scenes are all filled with a warm late summer’s light washing across the scenes. Great darkness will come, have no doubt. But in the mean time, have a relaxing time looking at the Elfin features of Queen Galadriel once more. Squint hard! That’s her up on the mountain top, having top level secret squirrel conversations with Gandalf about where they’ll hide the Lotto ticket if they win. So – who is going to the red carpet opening? We gonna hype this city up once more? Sorry got distracted by the render in the middle. Two flyovers for the price of one isn’t bad, nzta are really pulling out all the stops. Yes, methinks they are using Elvish magic on those flyovers too. Held up by unearthly charming skyhooks they are. Columns for the holding up of – they need not such basic concepts. Footbridge magic – talk about column free space! News Flash : Ship infested with Alien Soldier Beetles! The latest instalment of Hobbit mania has been revealed today, with a two-storey image of Wellington atop a towering Middle Earth mountain. Morning commuters would have noticed a two-stoery wrap – featuring an image of Wellington on top of a mountain and surrounded by roaring waterfalls – attached to the side of the Clemenger building on the corner of Kent Tce and Majoribanks St.
Clemenger managing director Andrew Holt said the wrap would be a backdrop for Wednesday’s Hobbit world premiere. Wellington Mayor Celia Wade-Brown described the piece as ”a fun piece of fantasy on a grand scale”. “Sir Peter Jackson has said that no-one else does a premiere quite like Wellington and this latest installation is further proof that the capital will be looking its very best for the premiere. 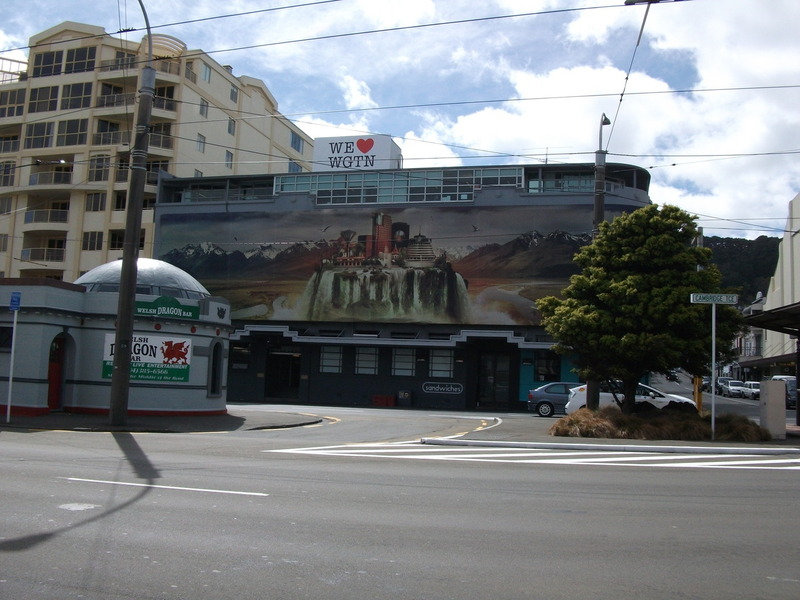 Clemenger BBDO, with the support of Wellington City Council and Positively Wellington Tourism, created the building wrap. Is it just me or is the buzz around the Hobbit in Wellington decidedly lacklustre compared to what was around when the LOTR films were released? Maybe it’s because I’m older (crikey – it’s 11 years since the FOTR) or maybe it’s because I know longer live on the fringe of the CDB having since decamped from Mt Vic to Ngaio. I don’t think I’m the only one with everyone in my office feeling much the same. I saw the huge Gollum inside the airport terminal last week and my response was very much “yeah…whatever…”. At first I thought it was just because I’m turning into a curmudgeonly old fart but interestingly my daughter and her friends feel much the same way. John H – have you changed your mind after today? Yes, things are different, and yes, we’ve all grown up and grown older, but the atmosphere today was absolutely buzzing. I reckon the first trilogy, LOTR, was so special for two real reasons – firstly that there had been such Absolute Secrecy on the filming, there wasn’t even the slightest leak to the media on anything. Secondly, that there was almost a disbelief that Wellington could pull something off on such a scale and such a public world stage. The premiere was audacious – we were all triumphant that “we” could do it. And now we’re all that bit older, and a bit more “meh, whatever”, but I reckon if you go and see it you’ll still be blown away. After all, the story of the Hobbit was always a much more enjoyable story than Lord of the Rings.